Poor though this summer has been, the restart of our local mallow bashing season has seen a couple of fine weekend days to get the season off to a good start, For those of you puzzled what I’m on about, I refer you to John Hunt’s SOS Puffin Report and an earlier blog. 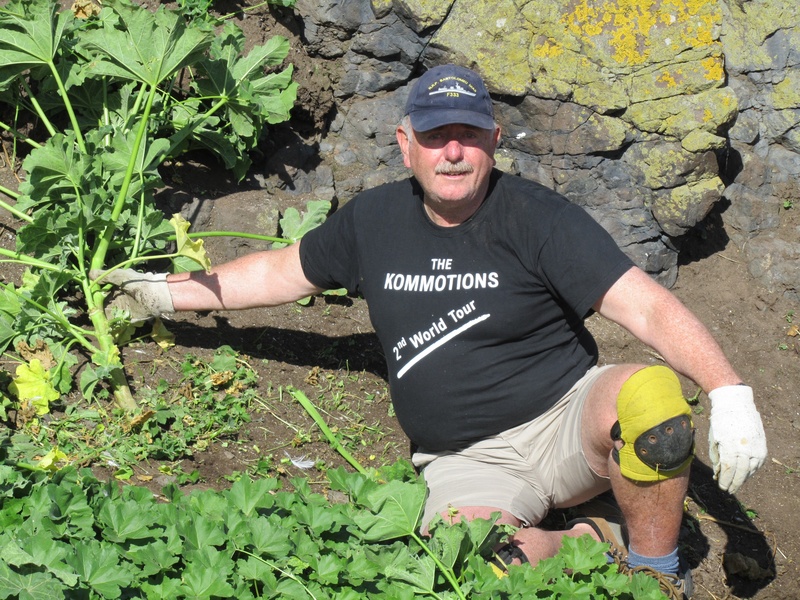 A week ago, the plan had been to land on Craigleith with a squad to clear this year’s growth of tree mallow (Lavatera arborea) that still infests the island because of its prolific seeds still dormant in the soil. See Scottish Natural Heritage’s 2005 Report for details but basically this non-native plant was throttling the local puffin population. Despite it being a brilliant day, a Westering breeze and sea chop exposed the ad hoc landing and we diverted to Fidra, whose small harbour is sheltered from the West. As days go, we couldn’t have asked for a better one in September. As the breeding season was over, the gulls usually nesting around the ruins of St Nicholas chapel were gone and all Fidra eerily silent. There are only a few hundred puffins nest on Fidra, as opposed to the 7-8,000 on Craigleith and we were not working the area around the lighthouse where their burrows are. 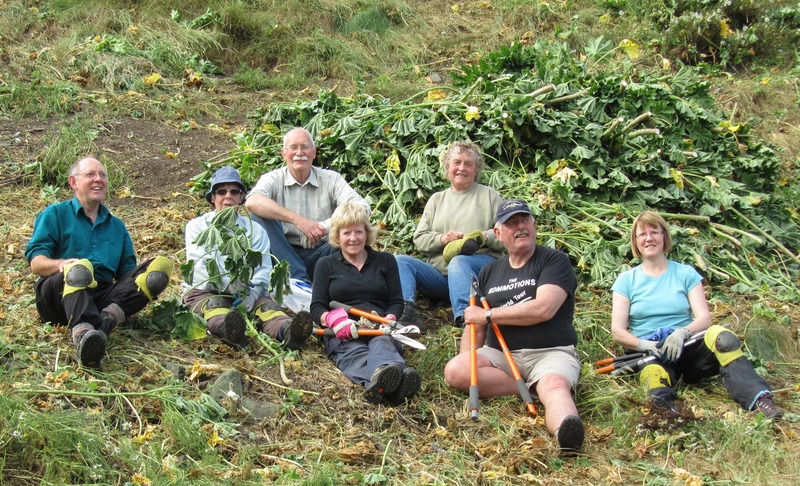 Nonetheless, we need to clear as much of the mallow as possible as its seeds carry easily from island to island, being eaten by non-seabirds then defecated. In the full day you spend on the islands you don’t get much time for socialising: you see a lot of hard work from all the volunteers and there’s never a shirker amongst ’em. John is a gentle taskmaster, so lunch is leisurely and gives you a chance to chat or explore. We use different techniques to eliminate the plant: strimmers will deal with seedlings early in the year, simple hand weeding on larger plants but for those really established (the larger stems can be thick as your arm—it’s not called ‘tree mallow’ for nothing) you need loppers or even a saw, cutting it close to the ground or the root will regenerate. 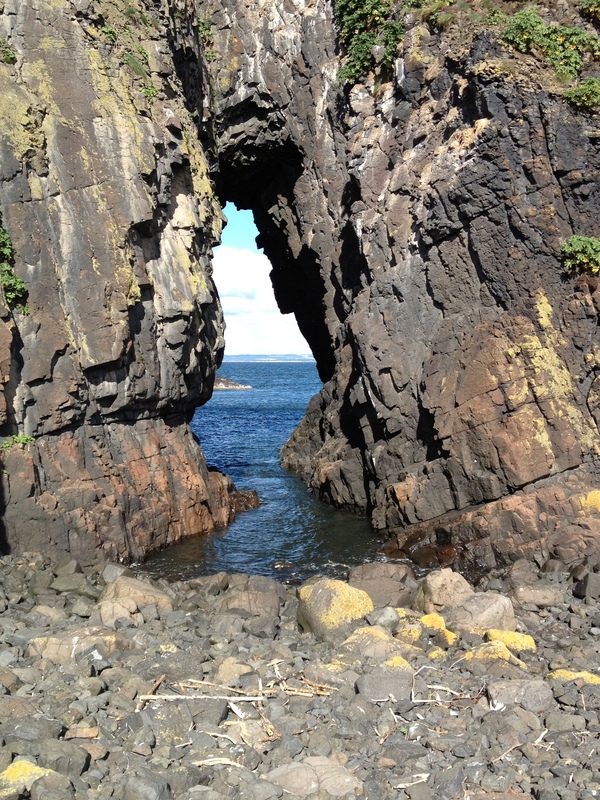 Fidra is full of history, although you have trouble finding it while you’re there. The local Congal tribe, who appear to have been a remnant of the once-powerful Goddodin, lost badly here to a band of Vikings under Arnulf the Dane in the 9th © and may explain the Norse name (“feather island”). By the 10th © it was an Anglian outpost on Northumbria which passed to Scotland after Malcolm won at Carham in 1057. 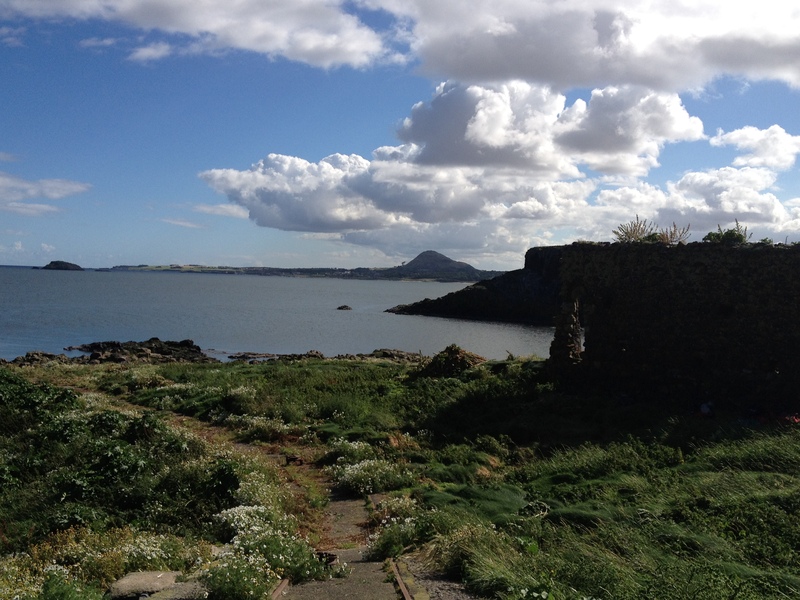 It then seems to have been a retreat for the first settlements under control of the Earls of Fife and the original pilgrim ferry may have gone from here before boats became too big to haul up on the beach and they moved to the nearest haven, thereby founding North Berwick. A stave fort similar to Traprain existed on Castle Tarbet and even a wooden bridge to shore over the shallow Brigs of Fidra. The single ruined wall on the island dates from around that time and was a chapel dedicated to St Nicholas. This was gifted to Dryburgh in 1165 but terminated by Alexander de Vaux in 1240 when that Norman family had built their castle 2km away at Dirleton. The lighthouse is a latecomer, another Stevenson effort built in 1878 and uniquely having a cable-drawn wagon railway to haul supplies and paraffin up from the landing, thereby saving the three keepers considerable work. When keepers were withdrawn in the 1980s and Bass Rock was downgraded, Fidra became the main light on the south side of the now-busy Forth, flashing its powerful 24-mile range beam four times each ten seconds. Work though it may be, just having the privilege to wander these islands is a magical experience that makes it worth the effort and brings you back tired and pleased and filled with images. If you’d like to participate, the squads go (weather permitting) most weekends and sometimes mid-week. Contact John, if indefatigable leader of hundreds of trips on johnf_hunt@yahoo.co.uk. And to see why we’re bothering, sneak a look at Tammie Norrie, clown of the sea and tell me if you don’t want to help out a fellow creature who—despite being among the world’s toughest and resilient seafarers—may be the living embodiment of the word ‘cute’. This entry was posted in Community, Environment and tagged seabirds; puffins; tree mallow. Bookmark the permalink.